Jon P. Carroll « James McElroy & Diehl, P.A. After graduating from the University of North Carolina at Chapel Hill, Jon earned his Juris Doctor from Campbell University School of Law, where he was a Notes and Comments editor for the Campbell Law Review. 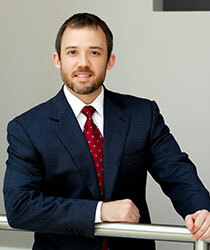 A member of the Campbell Moot Court Team, Jon was Campbell’s 2005 recipient of the Safran Moot Court Award. A native of Charlotte, Jon moved back home in September 2005 to join James, McElroy & Diehl. Jon became a partner in 2014. He currently practices complex civil and business litigation, contract disputes, shareholder disputes, disputes involving restrictive covenants and homeowners’ associations, debt collection and construction litigation. In his spare time, Jon serves as the Chair of the Board of Directors for Hope Haven, a local nonprofit organization that provides substance abuse treatment and recovery services for Charlotte’s homeless population. Jon is also a previous Chair of the Mecklenburg County Bar’s Bar Leadership Institute (BLI) Committee.